Kids and snow – what a great family vacation combination! If your family travel plans call for exciting winter activities both on and off the slopes, think about taking a family vacation in the winter wonderland of Chittenden, Vermont. This little-known New England town offers a wide variety of family travel adventures for every age and interest. Located just 11 miles from Rutland, the gateway to the Killington/Pico ski areas, Chittenden is the location of one of the Northeast’s premier Nordic ski areas: The Mountain Top Inn & Resort. The endless array of winter activities offered by this top notch Nordic ski center, with its secluded location, breathtaking views and pristine lake, makes it a great choice for a family winter vacation for those who want to get out and enjoy the beautiful New England outdoors. The Mountain Top Inn is situated on 350 acres amidst the Green Mountain National Forest and has over 60 kilometers of cross-country and snowshoeing trails. Approximately 40+ km of these are expertly groomed. The terrain is well varied, offering great skiing for all levels of skill. We spent three days at the Mountain Top Inn, and although we didn’t do any x-country skiing (having become Alpine skiers after many years of Nordic skiing), we were able to experience the beauty of the resort and its great trail system on snowshoes. The friendly staff at the Nordic Ski & Snowshoe Center will be very helpful in outfitting your whole family for Nordic ski rentals or snowshoes and can provide assistance in mapping out your trail selections. The ski school offers private or group lessons for all ages and levels of skill. Kids will love this experience. We were able to witness this one afternoon when a large group of school kids visited the ski center and excitedly climbed aboard the sleigh for a ride across the meadow and through the woods. We were informed that every Wednesday, a different school group comes to enjoy the sleigh ride. The 30-minute ride costs $25 for adults and $15 for children under 14. A guided snowmobile tour also gave us another way to explore the picturesque surroundings at Mountain Top. A 30-minute ride costs $60 for the driver (valid driver’s license required) and $15 for a passenger, who must be 12 years of age to ride. This guided tour offers an exciting opportunity to experience the resort’s trails. Our ride took us across open meadows and into some narrow, forested trails where we had to negotiate a variety of terrain. What proved to be the most unique winter experience at Mountain Top, however, was our dog sled adventure. Shawn, the dog handler who provides this service for Mountain Top guests, takes riders on an exhilarating race along the wooded ski trails. After zipping us into the protective cover of the dog sled leaving just our heads exposed, Shawn gave his dogs a quick command and off we flew across the meadow and into the woods. Our rides were scheduled for early evening. This proved to be a great time to go, as the dark trails were illuminated just enough by the coal-miners type lamp Shawn wore on his head. There is a weight limit of 400 pounds per sled, so a parent would easily be able to accompany a child on the ride. In addition to the thrill of the ride, we enjoyed learning a lot about sled dogs from Shawn, who quite obviously knows a good deal about Alaskan and Siberian huskies and their enthusiasm for pulling sleds. Shawn’s strong attachment to his dogs, as well as his understanding of them, was evident in the affectionate way he talked about them and his careful handling of their workload. A thirty-minute ride with Shawn and his beautiful dogs costs $75, but in our estimation it’s an experience you won’t want to miss. Another activity that families will enjoy is Nordic Quest. This is essentially a scavenger hunt on cross-country skis or snowshoes. As part of Nordic Quest, participants follow clues and hunt for treasure. Nordic Quest is a promotion of Ski Vermont, and a Nordic Quest Log Book can be downloaded from their site, www.skivermont.com, or you can get one at Mountain Top’s Ski Center. Get some exercise while having fun uncovering the answers to clues while you ski the cross-country trails at Mountain Top. Mountain Top also has a great sledding hill, which is illuminated for night sledding, as well as an ice-skating area. Both are available on a weather permitting basis. The Inn provides sleds, or you can bring your own. Ice skates can be rented at the Nordic Center. Once you’ve exhausted yourself with all the outdoor activities, take some time to relax either in front of the pot bellied stove at the Ski Center, which offers a small menu of sandwiches and soups as well as hot and cold beverages and great home-baked cookies. Alternatively, make your way back to the Inn and find a big comfy couch to curl up on in front of the fire. The main lobby of the inn with its roaring fireplace and an adjacent lounge are warm and inviting, just the kind of relaxing atmosphere that you expect from a country inn. Mountain Top has a variety of guestroom styles, all of which are beautifully decorated reflecting the Vermont style of a traditional mountain resort. Many of the rooms offer fabulous views of Chittenden Reservoir and the surrounding mountains, while the remaining rooms have wonderful meadow views. Accommodations range from luxury suites to classic lodge rooms, as well as some pet-friendly mountain cabins and private chalet homes. Rates for all rooms and chalets include a Vermont country breakfast, afternoon refreshments served each day in the lobby, as well as use of many of the outdoor activities. Rates during the winter or summer seasons range from $235 per night/double occupancy for a classic lodge room to $495 for a luxury suite. A one-bedroom cabin is $265 per night, while a 4-bedroom cabin is $475 per night. Many of the room choices can be viewed on the Inn’s website, www.mountaintopinn.com. Although brochures and pictures sometimes bear little resemblance to actual resort conditions, we examined a number of the rooms at the Inn and found them to be just as inviting as their pictures profess. Dining options at Mountain Top include the Highlands Dining Room, the Highlands Tavern, and the Terrace (for seasonal outdoor dining). The Dining Room offers elegant, gourmet dining in a relaxed atmosphere, where the cozy fireplace and antler chandeliers add just the right touches to this country setting. The menu is not extensive, as the chef limits selections, many of which are crafted from local ingredient. Some outstanding dishes include the pan seared venison chop with sweet potato puree and brandied cherry sauce, and the grilled gulf shrimp & diver scallops with quenelle of wild mushroom risotto and spicy pinot noir sauce. The chef changes the menu regularly based upon what he feels are the freshest available ingredients. An award-winning wine list complements the menu. The Highlands Tavern offers a less pricey menu of casual bistro fare in a pub style environment. Sandwiches, salads, soups, and burgers, as well as a limited number of entrees are offered. If it’s on the menu, you must try the butternut squash & apple bisque -- it’s outstanding. While waiting for their orders, kids can occupy themselves with the pool table in the back room of the Tavern. For that matter, since the Tavern and Dining Room are right next to each other, you might even consider having a intimate dinner for two at a table in front of the fireplace in the Dining Room, while the kids enjoy themselves in the Tavern. Since the Inn is secluded atop a mountain, there are no other alternatives for food within walking distance. However, plenty of choices are within a ten or twenty-minute drive. The town of Rutland is about 15 minutes away and Killington Ski Area is about 20 minutes. And with Pico Peak only about 10 minutes away, those who would like to do some downhill skiing have a couple of options. 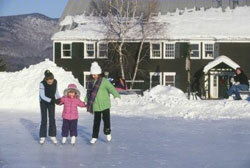 Winter may be a great time at Mountain Top, but the Inn is a great choice for a family getaway in any season. In addition to the varied winter activities, the resort is just as busy in the summer. Summer activities include swimming (both in the lake or outdoor pool), kayaking and canoeing on the lake, scenic pontoon boat rides, mountain bike rentals, clay bird shooting and lessons (must be 15 years old), fly fishing and lessons (must be 12 years old), tennis, hiking, golf at any of four nearby courses, and horseback riding. For that matter, Mountain Top boasts an outstanding Equestrian Center, which offers trail rides and lessons for all riders from neophyte to advanced in both Western and English. The resort also runs a Children’s Summer Camp for kids ages 6-9 and 10-12, offering a half-day or full-day program of activities and trail rides. Both a Winter Family Package and a Summer Family Package are offered. Other packages for more nights or larger cabins or chalet are available. All winter family packages include breakfast each morning, a horse-drawn sleigh ride, a one-hour family X-country ski lesson and rentals, trails passes for the length of the stay, and use of the resort facilities such as the sledding hill and skating rink. Summer packages are priced slightly higher and include similar activities. One interesting inclusion in the summer package is the one-hour massage for both parents. This would probably be quite welcome after a day of hiking, mountain biking, and trail riding. Information about these and other packages, as well as a wealth of information about Mountain Top Inn and its many activities, is available at the Inn’s website, www.mountaintopinn.com. Or call 1-800-445-2100 or 1-802-483-2311 for more information or reservations.